Low EMF lighting products are made in Germany, especially for the Building Biology movement. They are now available in the UK. A low electrosmog lamp is styled and disguised as a normal lamp. THE critical place for low electrosmog is where you sleep. Normal bedside lamps emit electric fields which mean that your sleeping place’s electormog can be way above building biology guidelines. The cable is shielded, the lamp holder is metal and earthed and the bulb is also shielded. Bed side lamps are one of the commonest sources of low-frequency electric fields in peoples’ sleeping areas. 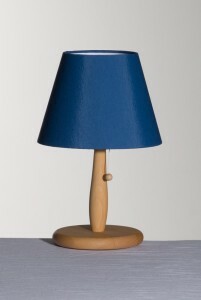 The lamp is made of beech wood, the surfaces treated with natural oil and wax (Auro 129). Wood is a natural product; each lathed work-piece differs in color and grain from the next. This product is made of materials with minimum out-gassing so it’s suitable for people with multiple chemical sensitivity MCS or those who want to create a building biology clean air environment. We have a range of low EMF lighting products in our shop suitable for living areas, kitchens etc. A note on the price – these lamps are made in low volumes in Germany, especially for the Building Biology movement. The method of production and quality of materials means they are more expensive than ordinary lamps. Manufactured in Germany. Supplied with a German plug, we will provide the necessary converter plug.